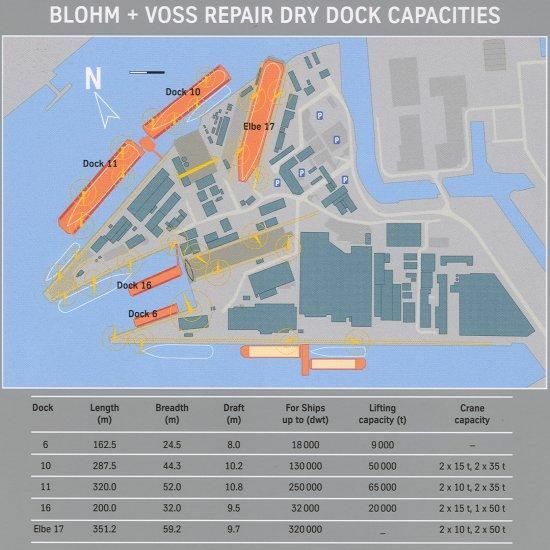 Our sophisticated equipment and optimal docking facilities guarantee we meet our customer requirements and allow us the kind of versatility that is expected from Blohm + Voss Repair. The first stage of the restructuring involved the creation of a facility with two covered floating docks fitted out with sliding roof sections. The docks can be moved and fixed in various positions to a supply pontoon. After extension, the larger Dock No. 5 now accommodates ships of up to about 9,000 t, permitting maximum dimensions of approximately 160 m (525 ft) length and approximately 26 m (85 ft) beam. The smaller Dock 12 can accommodate vessels of approximately 6,000 t with a length of 143 m (469 ft) and a beam of approximately 25 m (82 ft). Additionally one covered dry-dock with a capacity of approximately 300 m (1000 ft) can be used in Kiel. 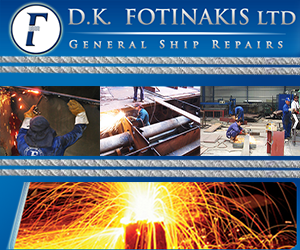 Repair, Conversion and Modernisation of Ships and Offshore Units. 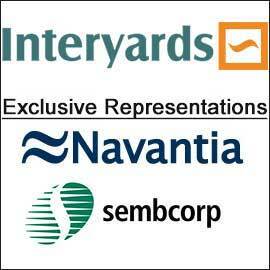 Dock facilities up to 351 m.